Associated Press Alex Bowman, left, congratulates Hendrick Motorsports teammate William Bryon for winning the pole Sunday for the Daytona 500. 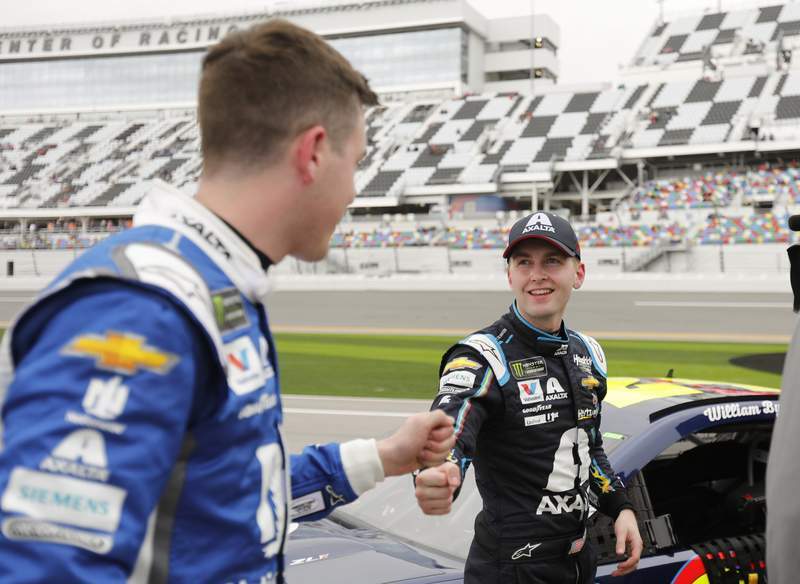 Byron, 21, and 25-year-old teammate Alex Bowman locked in the front row for “The Great American Race” during qualifying laps Sunday at Daytona International Speedway. They constitute the youngest front row in Daytona 500 history. The last four – Hendrick's Jeff Gordon, Chase Elliott (twice) and Bowman – have failed to notch a top-10 finish. Jimmie Johnson triggered a wreck that wiped out nearly the entire field at Daytona and zipped to the lead to win the rain-shortened exhibition Clash on Sunday. The seven-time Cup Series champion failed to win a race last season, but a dose of aggression put him in victory lane in the first weekend of Speedweeks.